Secondly, you pretty much lose all objectivity. Still, when it comes to picking Salman Khan's finest film, I can't help but recommend one of the most-viewed DVDs of all time, Raj Kumar Santoshi's hilarious Andaz Apna Apna. Call me biased. 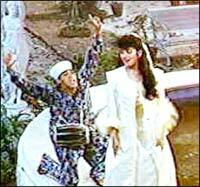 Slapstick madness begins from frame one as Amar (Aamir Khan) dreams of a life with Juhi Chawla. Simultaneously, Prem (Salman) is being bamboozled into trying his luck in films. Their fathers, a barber and a tailor respectively, are tired of their no-good antics, and have further cause for fury when the sons sink the family savings and fly optimistically off to the city. They are driven thus by newspapers declaring that Raveena (Raveena Tandon), a billionaire's only daughter, has come to India to find herself a suitable groom. Both lads imagine great wealth and set off, meeting in a bus and sizing each other up as rivals while putting on a friendly face. But why are we talking about the plot? This film is about the shenanigans, about the chaos and constant tomfoolery. 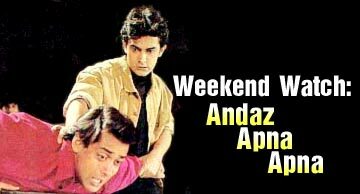 Andaz Apna Apna is a madcap, extremely over-the-top film with fabulously quotable lines and unforgettable characters in a familiar, totally irrelevant premise. Aamir and Salman riff marvellously off each other, and their gamesmanship is the heart of the film. Amar is a rascal, a cocksure rogue with sharp wits and a domineering manner. Prem falls for this intimidation, a relatively hesitant and easily-conned scoundrel, albeit with some tricks up his own, beefier sleeve. The dimunitive heroes set out to win Fair Raveena's heart, but Prem keeps getting foiled because he's distracted by her aide, Karishma (Karisma Kapoor). Things, however, aren't as straightforward as the hopeful boys expect, and several outlandish characters pop in to spoil their plans. Ram Gopal Bajaj (Paresh Rawal), Raveena's father is a strict disciplinarian, and disapproves of the filmi boys. It doesn't help matters when we discover his identical twin, the villain Tejaa. A switch is effected, and while the kids are trying to figure out which one is Tejaa, enter Crimemaster Gogo (Shakti Kapoor), Mogambo's nephew with a compulsive need to repossess. It sounds insane because it is; all plot devices functioning only to make you chortle, culminating in an irresistible climax. This is the kind of film the�phrase 'laugh-riot' has been�coined to describe. Aamir is terrific in his role, but for my money this film belongs to the bumbling Salman, and I'd rate it as his least affected performance yet. Paresh Rawal and Shakti Kapoor emerge the most quotable, and this is one of the few films where Karisma's squeakiness is almost tolerable. Raveena, as the pouting brat, actually gels quite well with the actors. Mr Santoshi, this would be a treasure on a Special Edition DVD. It would be priceless to have commentary tracks, to hear how Aamir and Salman now rate this lunatic comedy, almost a dozen years after it was made. We grew up with Andaz Apna Apna, and when it came out in 1994, it was one of the greatest comedies in recent times. Hence the cult status that almost allows the film to rub shoulders with true great Jaane Bhi Do Yaaron. Today, on the other hand, if you watch it for the first time, I doubt you'd be as awed. The film is decidedly dated, with some of the farce very overdone. The performances are violently over-the-top, with good-natured hamming and some lines that have been quoted so often in films afterward that they may fail to amuse. It tries too hard. But it doesn't matter. This is a cornball classic, and once you're hooked, you can't help mouthing the outrageous lines as you watch reruns again and again and again. When Aamir ribs Salman, declaring that his dad wrote Sholay, you smile at the obvious, affectionate in-joke. That's what Andaz Apna Apna is all about. oh yes,it truly is a great humourous movie.i have seen it umpteen number of times but still can't get enough of it. Sub: You Surprise me !! !